The purely irresistible, rich and decadent Pecan Pie! 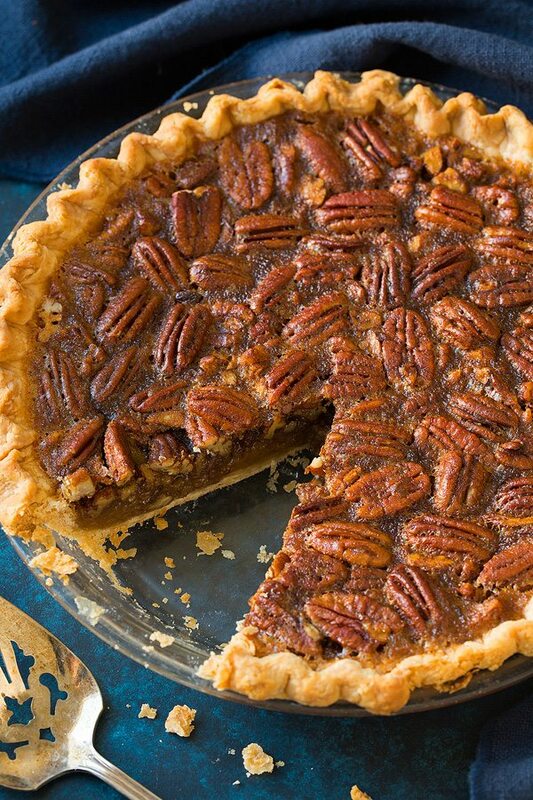 It starts with a delicious flaky crust and is filled with the most irresistible pecan filling. A classic pie recipe that always deserves a spot on the Thanksgiving menu! 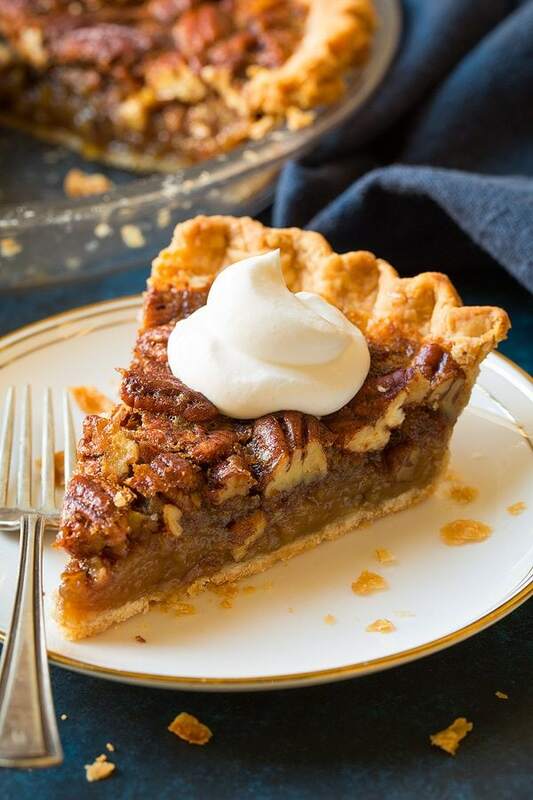 The Perfect Pecan Pie Recipe! From what historians have found apparently the pie goes way back to 1800’s with the earliest dated recipe showing 1886 (but some would say earlier than that). So this humble pie has some history and it’s here to stay. And for good reason! 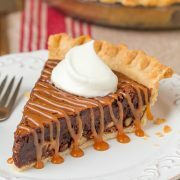 This pie is brimming with nutty flavor, it’s deliciously buttery and this sweet creamy filling just makes your tastebuds sing! After just one bite you’ll agree, it’s a pie that should be on the Thanksgiving menu every year! Prepare pie crust then blind bake it (so it’s not soggy after adding wet filling). For the filling: sprinkle 1 cup chopped pecans into pie crust, then sprinkle in 1 cup whole pecans. In a mixing bowl whisk together brown sugar, salt and cinnamon. Mix in butter, corn syrup, eggs and vanilla extract (there should be no streaks of egg). Pour mixture evenly over pecan layer in crust. Transfer pie to a baking sheet. Bake in lower portion of the oven on baking sheet until set. 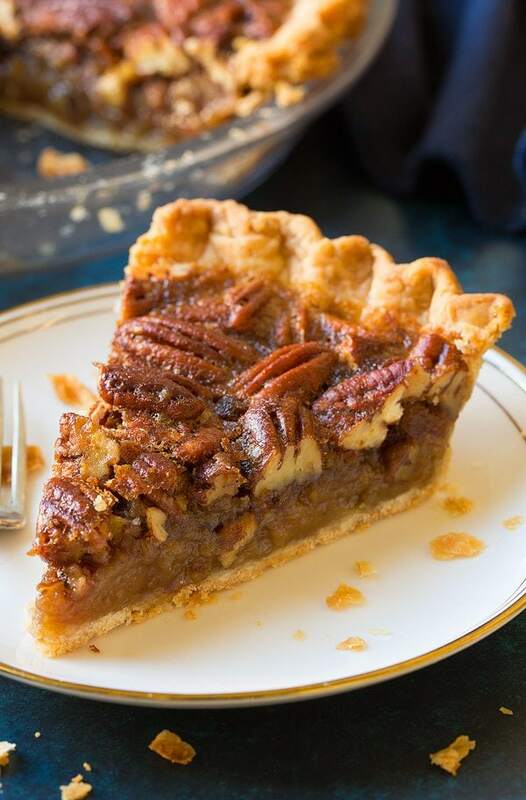 I hope you do get a chance to try this pie this season, this is my idea of the best pecan pie! I hope all of you have a wonderful Thanksgiving! Let the countdown begin, I can’t wait for all the goodness to come! More Pie Recipes You’ll Love! The perfect pecan pie recipe! 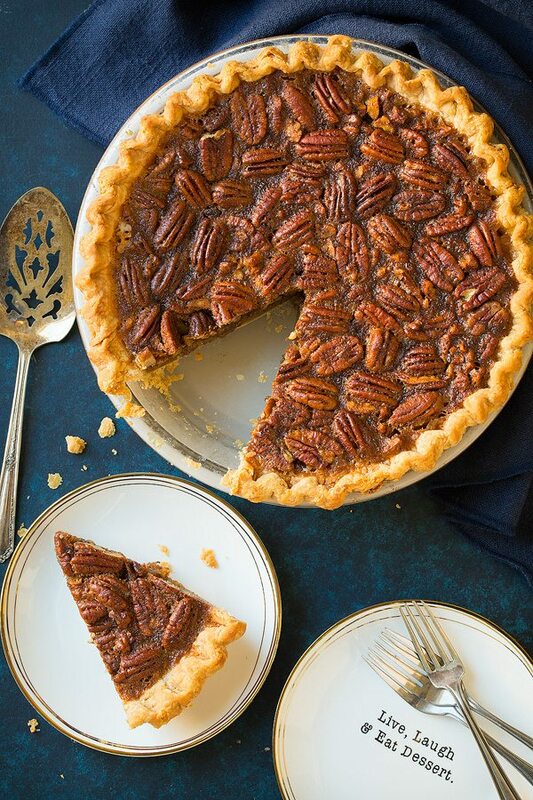 It starts with a buttery, flaky blind baked crust and it's filled with the most irresistible, rich pecan filling. A classic Thanksgiving pie people will love! For the crust: In a mixing bowl whisk together flour, sugar and salt. Add butter and cut into flour using a pastry cutter or a long pronged for until mixture resembles coarse meal with small visible chunks of butter. Add 1 Tbsp of water at a time and fold with a rubber spatula, while adding just enough water until mixture has almost fully come together and is in moist clumps. Gently press dough together and shape into a 6-inch round disk, wrap in plastic wrap and chill 45 - 60 minutes until nearly firm. Dust a clean work surface with flour and roll crust out into a 12-inch round. Fold dough in half then fold in half once more, transfer to a 9-inch pie dish with the folded corner of the dough in the center of the pie pan. Carefully unfold dough and fit into dish. Trim excess crust coming within about 3/4-inch of the pie dish. Tuck that excess under crust and flute or decorate as desired. Pierce bottom and sides of the crust all over with a fork. Transfer to freezer and chill 15 - 20 minutes until firm*. Meanwhile preheat oven to 400 degrees. Place pie on a baking sheet. Fit two layered sheet of foil snugly against the pie crust (but being careful not to smash decorative edge but still covering loosely), fill with 2 lbs of dry beans**. Bake crust on baking sheet in center of oven 15 minutes. Remove from oven. Lift out beans using foil. Return to oven and to bake 10 minutes longer. Reduce oven temperature to 350 degrees. For the filling: Chop 1 cup of the pecans then sprinkle evenly into pie crust. Sprinkle 1 cup whole pecans over chopped layer. Set aside. In a mixing bowl whisk together brown sugar, salt and cinnamon. Mix in butter, corn syrup, eggs and vanilla extract (there should be no streaks of egg). Pour mixture evenly over pecan layer in crust. Transfer pie to a baking sheet. Bake in lower portion of the oven, covering edges or tenting entire top of pie with foil as needed***. Bake until pie is set, about 45 - 55 minutes (it should appear set when you nudge the baking sheet, a very light giggle is fine). Transfer to a wire rack and cool completely. Store in refrigerator until ready to serve. *I recommend using the homemade crust recipe list but I'm guessing some of you may prefer to just use a store-bought crust. If so doing then par-baking the crust wouldn't be necessary, just fill then bake as directed once filled. **Pie weights or even granulated sugar can be used here as well. ***I covered the edges of my pie shortly after putting it in so they didn't brown too much, then I had to tent the entire pie to prevent the top from over-browning at about 40 minutes. 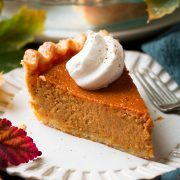 Jaclyn: My custard is maybe a little more set then the recipe you’ve used and yes I always cut pie with a sharp knife :). You could maybe try chilling the pie for a bit first too for cleaner cuts. Corine: I live in Germany, and corn syrup is just not a thing here… Any substitutes with sugar / water for example? 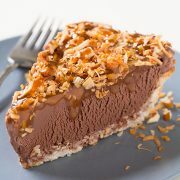 Joy: As a rule, I use a Pillsbury pie crust ~ sometimes the corn syrup mixture goes through the bottom crust & becomes a mess to try and lift out ! Do you know why this happens? Lauren: That sounds so delicious and I would like to bake this cake for Christmas, but I live in Germany and we don’t have corn syrup here.